I recall, in my twenties, that the Rabbanut in Israel had chosen the Tenth of Teves as an appropriate day for which Kaddish should be recited for those who were murdered in the Holocaust and about whom we do not have the date of their cruel demise. If I remember correctly, it was also when I learned Rabbi Chaim David Halevi’s עשה לך רב, that I came across this idea. That background also prompted me to buy and read his biography, more recently. 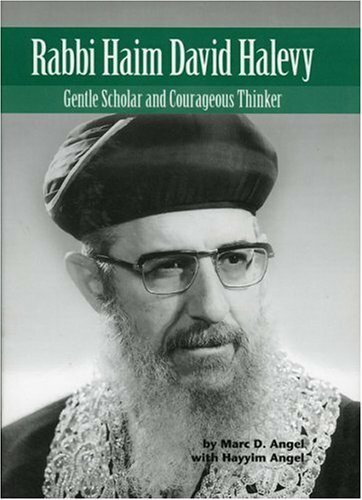 If you haven’t come across R Chaim David Halevi’s scholarship, I recommend it. What is the importance of the Tenth of Teves? It is one of the minor fasts that are described explicitly in Tanach. The siege of Yerushalayim our Holy City, during the 1st Temple, began on the 10th of Teves. Symbolically this represented the beginning of a tragic, calamitous, series of unfolding Galus-oriented historical events. Indeed, the 8th and 9th of the Month are also recorded as days identified as sorrowful. This fast represents our existential Galus state and is observed even if it turns out on Friday, Erev Shabbos. The Israeli Chief Rabbinate saw in that date, an appropriate day to add the mourning for those who were murdered in the Holocaust. In particular, that date was also chosen as the one to say Kaddish for those whose date of murder is unknown. The policy has been that we have enough sad days and associated fasts, and whilst the Holocaust is surely the major calamity in our history after the temples were destroyed, commemorating it during Nissan isn’t recommended (via Yom Hashoa) because we don’t utilise Nissan for sad events. The link between the Tenth of Teves and the Holocaust is clear. The fact that the Jews were removed from their Capital Holy city of Jerusalem, and its Holy Temple represents the existential Galus which we find ourselves in today, and which will only be terminated once the Redeemer comes upon Zion, gives it a pointed segue. In the past, this detail didn’t mean too much to me because I didn’t say Kaddish and sadly, I don’t see many Shules choosing this day (or the ninth of Av) as formally remembering the Holocaust. I do not know why the 10th of Teves would be objectionable to anyone. These days, I say Kaddish on my father’s a’h Yohr Tzeit, and those of my parent’s parents, and other members of the family who for whom nobody says Kaddish. Accordingly, I now ask myself whether I should also say Kaddish on the Tenth of Teves for members of our family who were murdered on an unknown day during the Holocaust. I can’t think of a reason why I would not. Indeed, I ask myself why anyone who is able to say Kaddish, and knows they had family members who were murdered on an unknown date, would not say Kaddish? It seems straightforward that they should. The only reason I can think of is that this fast is mentioned in Tanach and tacking on other reasons might not be appropriate. I don’t agree however. History for Jews is a chain reaction. It is not the outcome of disparate discrete events. About your article concerning Tischa b’Av, here are some of my observations. About your AL CHETs (“Who can” and “Who cannot”); you mention daily events at present, not Tisha B’Av ones. Maybe we should read it on Yom Ha’Atzmaut or on its eve, Yom Ha’Zikaron to remind us that we were a nation before and take care at present that we remain one? Rabbi Dr Cardozo is a thinker. This is a hallmark of those with intellect. At the same time intellect may preclude a level of Bittul. I don’t have his intellect, but I’m often accused of not being able to exhibit Bittul. Indeed, this week’s parsha includes a wonderful vort from Rav Soloveitchik which sums up this concept. I wrote it for another forum and will put it up before Shabbos. It tends to be those who are more inclined to mould judaism into new trends, that I refer to as the left. Open Orthodoxy and Partnership Minyanim, and things of that nature (as opposed to Yoatzot Halacha) are the types of things which I call “left” wing. Rabbi Benny Lau is another who I see sometimes express himself this way. I don’t see Rabonim who live in this world and are not cloistered in an attic, like Mori V’Rabbi Rav Hershel Schachter, as ‘right wing fundamentalists’. He is at YU and heads Psak at the OU, and in all my correspondence with him, I have found him to be as straight as an arrow, and moderate, maintaining the strong Menorah base transmitted to him from Rav Soloveitchik. One thing he isn’t, is a philosopher. Who can not find a day to be sad when a Jew from Jerusalem is called up to the Torah and is asked “what is your name”, and they answer “Chaim”. And after being asked “Ben?” they say “Ben Esrim V’shmoneh”? It’s not funny. On the other hand, a relative of mine was called up in the diaspora. He said his name: Ra’anan Lior ben Avraham, the Gabai said: not your secular name, your Hebrew name. I am not sure how Rabbi Cardozo qualitatively defines the Messianic era, but it seems to me, if he enunciated that, he’d have no issue, on the saddest day of the year, to join in the Shiva, that we all take part in. Don’t we eat meat and drink wine during the Shiva? On Yahrzeit we have a Kiddush (not our minhag). It is true, that our Rabbis also promised us that this will be transformed to a day of Yom Tov. We still do not have a Temple, but we have a Yerushalayim. Is it the time to transform it to a Yom Tov? We changed the “l’Shana ha’Ba’a Bi’Yrushalayim” to “l’Shana ha’Ba’a Bi’Yrushalayim HABNUYA” the addition is for the Temple – we already are in Yerushalayim. I feel this is syntactic and in fact supports my comments and not opposes them. Halachically, it is true, that there are ramifications being in Yerushalayim: for example Korban Pesach. Rabbi Cardozo, surely you aren’t suggesting you see the Yom Tov, but are blind to the myriad of reasons to be sad? I attend Yom Hashoa out of solidarity, but my real Yom Hashoa tacks onto Tisha B’Av. Each one with his own feelings and customs. I ask myself: Why would G-d destroy HIS home? It was a place where the Jews worshiped G-d, and not a home of his people. I do not know G-d’s intentions, but shall try my understandings or reasoning. Can one imagine anyone bringing today sacrifices? How would Judaism look if they did? Can it be that G-d’s intention was to stop those sacrifices, and the best way was to destroy the building? ונשלמה פרים שפתינו. We have quite a limited view of the world and its future, as against G-d who has a wider one. At the destruction of the Temple, the Jews were driven out of their city Jerusalem, many were killed others dispersed among the Nations, and many were sold to slavery. They did not enjoy those days, they suffered quite a bit. They probably said Kinot. But G-d had a wider view; my children are going to dwell all over the globe, learn different trades and cultures. Had we stayed in our country, with the Temple, I (or probably also you) would surely dwell in my tent in the Negev as a shepherd looking after my flock – just like a Bedouin. The same with the holocaust, I can still not see the whole picture, but one is that the Jews, after the terrible holocaust, are again a NATION with their own country. Would the world grant us a piece of land if there was no holocaust? Would the Jews come to Eretz Yisrael, the land of desert and camels? Maybe it isn’t yet a full Geula, but surely a beginning. Why did we need six million sacrifices? Would not one million or fewer be enough? Please do not put this question to me. I am not G-d’s accountant. By the way, in one of the Agudat Yisrael Knesiot (5679 Zurich) there was a discussion whether Jews are a Mosaic sect or a Nation! Because of such a question my father in law, and other German Rabbis left Agudat Yisrael. I thought that Yetziat Mitzraim was our transformation from a nomadic tribe into a Nation. Was I wrong? I’m a second generation holocaust generation, but feel it acutely, likely due to the fact that for most of my life, I was surrounded only by holocaust survivors, who would challenge my religiosity, even when I was 10 years of age and ask me questions that I could not and dared not answer. It is certainly the case that history would record that an outcome of the holocaust was the re-establishment of a Jewish homeland. These are happenings that I don’t understand either. Do I have to pay 6 million lives to acquire something that we have already been promised? Did God not have other more gentle ways to somehow not interfere and yet interfere in the ways of the world so we would have the same outcome? Why didn’t he send Eliyahu down before the final solution and say ENOUGH. ושבו בנים לגבולם. I don’t know and I don’t believe anyone knows, despite the Satmar and other rhetoric. Indeed, on Tisha B’Av, as we sit on the eve of the full redemption, we can only sit exasperated while more human korbanos occur, and anti-Zionism is the new anti-Semitism, and Tisha B’Av encompasses all that. Sure, on Yom Ha’atzmaut and on Yom Yerushalayim, when I was a student in Israel, I celebrated. I went to Yeshivat Mercaz HaRav, and euphorically danced all the way to the Kosel, and for the entire night danced until we davened Vatikin. We know how important it is to sing and give praise. Chizkiyahu Hamelech would have been Mashiach if he had sung, as openly stated by the Gemora in Sanhedrin (from memory). I just expressed my humble thoughts. And I thank you so much for sharing them. I heard second-hand, that Rabbi Cardozo felt I had not understood his points. That maybe so. As it is the Yohr Tzeit of the famed R’ Chaim Brisker now, I’d like to express that his Neshomo should have an Aliya. He revolutionised Torah learning. Last night, as is traditional, we attended the Yom Hashoa Commemoration at Robert Blackwood Hall. My parents, both survivors, together with more than 15 of their offspring, sat in a row on the ground floor. Compared with my youthful recollections of the memorial, the last ten years have been exemplary. Representation from Jewish Schools in choir or prayer, together with witness testimonies typically dominate the program. This year commenced with a similar motif. Simply listening to a testimony is riveting, humbling and often a highly emotional experience. There is no need or place for theatrics, props or fancy multi-media. The barren figure of an elderly survivor speaking from a podium is a most powerful image. In some years, organisers have employed the recitation of poetry or similar artistic device. Those devices do nothing for me, personally. I am overly grounded and, although I am a musician, alternative displays of artistry do not add to my night. The testimony from Sarah was extraordinary. Speaking eloquently and without notes, Sarah took us through the moment she was separated from her parents in the Ghetto to the present day. She described her odyssey, her pain, and her haunting memories. Around me, the gasping and incredulity was palpable. I felt like an indiscriminate ant in the cosmos of surreality and struggled to hold back tears. Over the last 40 years that I have attended commemorations, there has always been the recitation of Tehillim, in both Hebrew and Yiddish, by two representatives of Yeshivah College. This year, for an unknown reason, they were replaced by two girls from Beth Rivkah College (which had already been represented by their primary girls choir). Thinking the worst, I suspected that Yeshivah had pulled out of the event. I fired off an email and, that evening, received an immediate answer from Jerusalem. Unbelievably, Yeshivah had received a letter which stated that their services would not be required. I am flummoxed. Why would the organisers allow such a circumstance? What type of enfranchisement are they seeking to foment? Please now tell us what your contribution to the evening will be. Enough about you and what you do. What are you going to contribute this evening that will help us commemorate the memory of the Kedoshim. How will you transport us back in time and help us experience and remember the enormity of the calamity to our people that was the Holocaust. Will you take us on a virtual tour of a Shtetl? Will you transport us into the bosom of a Ghetto or Concentration Camp? Will you struggle with the theological spider web induced by the moral turpitude of the human race? Unfortunately, the presentation had little to do with these issues—the issues we were seated in the hall to solemnly remember. Instead, we were served an agenda more readily apparent in left-wing circles. Lectured to remember that the world is still depraved and that we should be actively fighting against atrocities in Darfur, Sudan and the like, we were informed of useful meetings with leaders of the Sudanese community to help them deal with multiculturalism in Melbourne. We were, perhaps, meant to feel proud that they had enjoyed the attendance of the president of the JCCV. At this point, I and many others, were quietly seething. We didn’t need to be lectured on morality; certainly not tonight. The Holocaust was the worst tragedy in human terms that has occurred in our Jewish history. We were well aware of our place in the world. The most remote suggestion that to find “meaning” in the Holocaust today is to translate the miracle of our survival into a “Tikun Olam” style agenda where our role in this depraved and hypocritical world is to help poor people facing mass killings in their own countries, is downright facile. Did he think that had the Holocaust not have happened, our moral fibre would not be as strong? Did he think that the history of the Holocaust was a bizarre motivational prop to be utilised for the creation of a new, public and morally inclined, “Jewish identity”. Were we sitting in sadness in order to induce an inclusive Jewish moral spine into society at large? No, sir, this was the night where people say Kaddish for our murdered. We remember our Kedoshim. This was a night where we commemorate our cataclysmic event. This was a night where we struggle to understand. Nobody can help us understand the enormity of our sadness. A lack of understanding is not healed or helped by those who distribute Jewish Aid to non-Jews. This is not a night for neo-moralistic tikun olam-style lectures. Nobody put it better though than the Rav, in a letter he wrote on April 4, 1953, to the then president of the Rabbinical Council of America, Rabbi Theodore Adams. 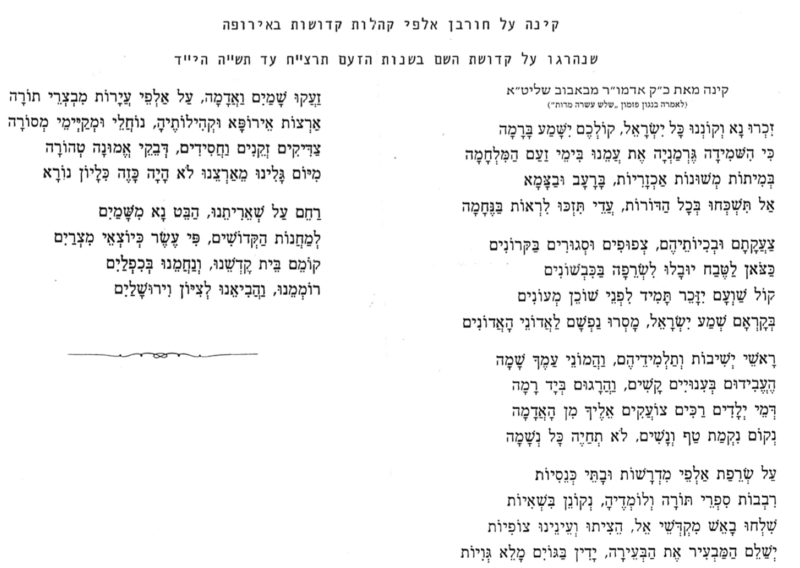 The Rav was addressing a joint religious/secular proposal to include a new liturgical paragraph into the Hagada, in order to commemorate the Shoah. Last night, I witnessed an incarnation of the self-same philosophy that, perhaps unintentionally, substitutes our specific historico-Judaic experience with a humanistically-inspired tikun olam dogma. I have just returned from Monash University where the Melbourne Jewish Community commemorated Yom Hashoa, remembering the 6 million Jews who were murdered by the Nazis, may their names be blotted. Many families were seen attending together with a parent or grandparent, who are holocaust survivors. What person would not join their parent or grandparent on such an occasion? Sadly, I witnessed some families attend, as they always did, only this time without the Holocaust survivor in tow. Alas, the survivor had gone to meet their maker. When I was a boy, attending this event was almost a punishment. It used to be held at Dallas Brooks Hall and maybe even Festival Hall before that. It tarried for what seemed an eternity. One could barely hear a non-Yiddish phrase. The evening was full of long speeches by people who spoke only the Queen’s Yiddish—the Litvishe style Yiddish so consummately enunciated by Bundists. I used to pray for the choir of old men and heaving women to emerge, for I knew that when they plodded onto the stage, it was time to sing the famous Partisan Song, that haunting melody forever etched in my mind. The lyrics were composed by Hirsh Glick, and tonight in Melbourne, we heard from Glick’s friend, Phil Maisel, formerly incarcerated in the Vilna Ghetto, who personally related the scene when Glick wrote the poem, thereafter describing how Glick was murdered by Estonian prison guards after trying to escape with a group of 40 inmates. The Rav said that every time a Jew stops and remembers the Holocaust he fulfills the positive Torah command of remembering Amalek, זכור את אשר עשה לך עמלק. Times have changed. We no longer endure the long and winding speeches mainly from members of the Bund. We have also lost the heart-rending and eloquent speech from Rav Chaim Gutnick ז’ל who captivated every heart on these occasions, often on the theme of the dry bones coming to life, the עצמות היבישות of the נביא יחזקאל. Instead, the devices of multi-media are intermeshed with chosen personal testimony, interesting narrative, and soulful choirs. The commemoration does not take long, is usually very powerful, and serves the purpose of transporting many of us, back in time, amongst the Nazi killing fields. The traditional universal day of mourning to remember and mourn Jewish tragedy is Tisha B’Av. The Rav strongly felt that Tisha B’Av should also be the day when the Holocaust is remembered. When Menachem Begin, then Prime Minister of the State of Israel, visited the Rav, one of the topics they discussed was contemporary modes of Holocaust commemoration. The Begin and Soloveitchik families were very close in Brisk, with Menachem Begin’s father being R’ Chaim Brisker’s Gabay. The Rav reportedly convinced Begin to press the Knesset to adopt Tisha B’Av as the (correct) day to also commemorate the Holocaust. A young Rabbi Shlomo Riskin, was also present at the Rav’s house at that meeting, as he describes in his wonderful collection of essays entitled “Listening to God” (I highly recommend his book). Upon returning to Israel, Begin, however, faced oppostion to this concept on practical grounds, because Israeli school children would be on holidays on Tisha B’Av and Ministers felt that the commemoration would be largely uneventful with the secular public. Ironically, whilst the Kinos on Tisha B’Av are literally crying out for a Kina related to the Holocaust, and I have been personally moved by the Kina authored by the Bobover Rebbe ז’ל, the Rav (like his Uncle R’ Velvel ז’ל but for a different reason) was opposed to us adding new Kinos since we don’t have the ability to write with the requisite authority and style. The Chassidic genre, like the Bobover Rebbe, had no trouble adding a Kina and neither did the German-derived Rabbi Schwab ז’ל of Breuer’s Shule. An interesting question can be asked: during the time of the second beis hamikdash, did the Jews fast on Tisha B’Av? On the one hand, the first temple was destroyed, and the level of miracles was lower in the second beis hamikdash. On the other hand, is it not anachronistic to mourn the destruction of the Beis Hamikdash whilst the second Beis Hamikdash is standing and in use? It appears that both Rashi and the Ritva in Gemora Rosh Hashono 18B held that during the second beis hamikdash they did not fast on Tisha B’Av. On the other hand, the Rambam in his Pirush Hamishnayos to the first perek of Rosh Hashono, in the third Mishna, opines that the Jews did observe Tisha B’Av even during the time of the second Beis Hamikdash. The reason would seem to be, that although we regained the right to bring Korbanos (sacrifices) in the second Beish Hamikdash, after the destruction of the first Beis Hamikdash, there has been and there is no end to the tragedies that befell and continued to befall our people. The Rambam held that until the Redemption, there is a direct link beginning from the destruction of the first Beis Hamikdash extending until our times. Tisha B’Av essentially commemorates the beginning of, and the continuation of, Jewish suffering. The second beis hamikdash was a temporary hiatus; it did not signal an end to Jewish suffering and so the Jews, according to the Rambam continued to fast. The Rav, perhaps following the Rambam, felt that no new mournful days should be added and that Tisha B’Av was more than just the destruction of the Temple. Tisha B’Av signified both the beginning and the continued suffering of the Jewish nations, reaching the contemporary unfathomable holocaust of our generation. Many ask why Rebbi cried. Surely he should have been happy that R’ Elazar Ben Durdaya had been accepted to Heaven with a “clean slate”. Reb Chaim Shmulevitz ז’ל explains that Rebbi cried in recognition of universal human frailty. Each one of us potentially experiences a gripping moment in our lives that is capable of transforming our thoughts and deeds. Rebbi cried because so few of us are able to recognise or “seize the moment”. Our generation lives with that moment. It’s in our blood. In terms of the Mitzvah to remember and not forget Amalek, our generation was cursed through the cataclysmic and inhuman tragedy of the Holocaust. If this remembrance though means that some, especially in our generation, choose a different date to remember, or different devices to remember, so be it. I will live with their choice, and join them. If only we could all seize the moment.